Have you ever seen strange white or brown lines on a leaf and wondered what caused these odd patterns? As our nighttime temperatures continue to warm up, you may begin to see them more frequently. 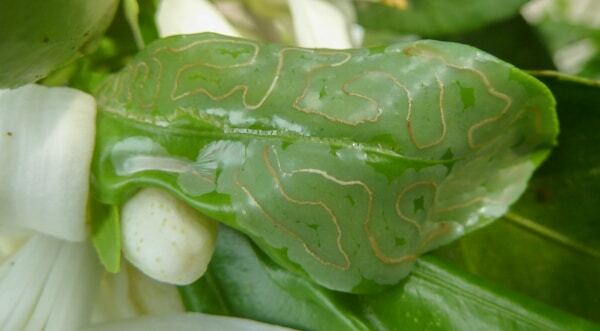 This photo shows a citrus leaf with the tell-tale signs of leafminer damage. You may have already suspected that the patterns are caused by an insect. There are actually several types of insects, collectively referred to as leafminers, that are known to chew tunnels within the leaves of our plants during the larval stages of their development. These moths, beetles, and flies tend to lay eggs on new foliage in spring, and some species can continue to attack in cycles throughout summer and fall. Because these critters are very small, they’re often more easily identified by their tunneling patterns and the type of plant that they’re chewing on. The serpentine, frass-filled tunnels in the above photo, along with the fact that this is a citrus leaf, identify this particular pest as a citrus leafminer. There’s the culprit (shown in the palm of my hand for scale). The good news about leafminers is that they rarely cause any substantial damage to the plant. In fact, leaves with telltale tunnels are often still functional after the bug has done its tunneling. Because they do only minor (no pun intended) damage to the plant, and because they’re difficult to treat once eggs have hatched, chemical controls aren’t often recommended to control leafminers. Many of the commonly used chemicals are likely to kill the leafminer’s natural enemies along with other beneficial insects that live in your garden, so chemical treatment is only recommend for the most severe cases. If chemical use is absolutely necessary, the one that we recommend is called spinosad. This naturally produced organic chemical is absolutely safe for humans (which means it can be used on fruits and veggies), and it breaks down relatively quickly in the environment (which means that it has a limited impact on good insects if you use it correctly). One of our favorite spinosad-based products is Captain Jack’s Deadbug; available at Civano Nursery in a variety of forms and concentrations. Who wouldn’t want to buy an organic pesticide with this suave mustached mascot on the label? For most home garden situations, leafminers can be safely and effectively mitigated with a little bit of knowledge, keen observation, and some easy maintenance. If you’ve noticed that a particular plant gets attacked every year, or if there’s a specific plant you’d like to protect, you may be able to watch for the tiny white or yellow eggs to appear on the undersides of the plant’s leaves. You can easily wipe them off or squish them before the larvae hatch and burrow into the leaf. It’s OK to pluck leaves off and destroy them if only a few are harboring tunnelers. However, don’t just pluck the leaves and drop them on the ground, as this isn’t guaranteed to kill the larvae before it emerges from the leaf to pupate. Leafminers sometimes overwinter in fallen leaves at the base of a plant, so it can be helpful to keep the area around the plant clean of debris, especially through winter and early spring. New foliage is most attractive to these insects, so limit fertilizing and encouragement of tender new growth on susceptible plants, and keep an eye out for eggs or damage as new leaves begin to grow. If you’re interested in reading more, this printable PDF, published by the Colorado State University Extension, is a fantastic resource for additional information about leafmining insects.